Count down for GreenPepper Successor! GreenPepper is a powerful tool that supports implementing collaboration driven methods like Behavior Driven Development or Specification By Example. Due to its smart integration into Atlassian Confluence it is still one of the best tools to evolve a living documentation system mainly if you are already using Atlassian Confluence as your Knowledge Management System. Actually this feature is exclusive for GreenPepper compared with of its competitors. Some of these like JBehave & Cucumber are very developer friendly and not really accepted by non technical experts like Business Analysts/Experts or business Testers. Even the nice reporting features provided by those tools or their extensions/plugins cannot really compete with GreenPepper. 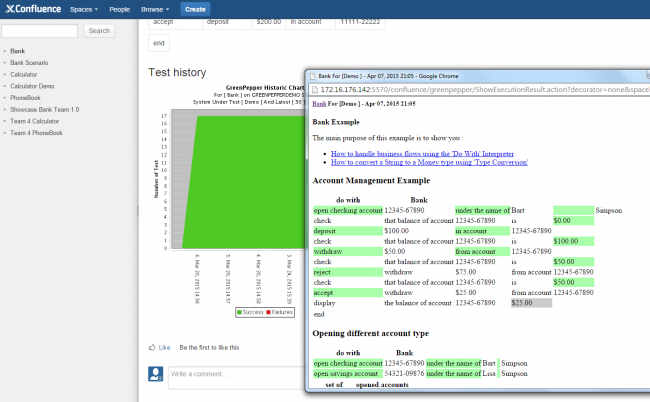 First the testcases are specified in Confluence. Not in the developers environment. Not in Git or SVN. This might be inadequate for the developers but it is very important for non technical experts. They can see the executable specifications anytime, anywhere and independently from any developing environment. The comfortable editing possibilities of confluences are used to write the feature specifications and the acceptance tests too. Another great feature is that you due to confluence you may have all of your documentation types at one place: business/feature documentation (with GreenPepper Tests), technical documentation, system documentation, a.s.o. 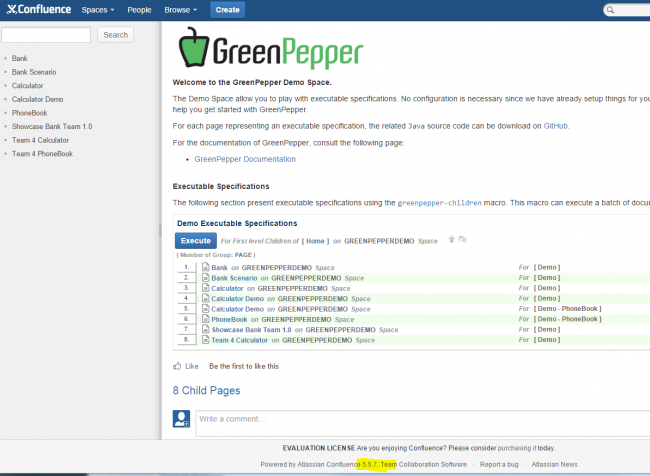 A good news is that GreenPepper since last year open source on GitHub. But. Yes. There is a big But. The Team behind GreenPepper has abondonned the development since some years and they are focusing on other things. And now the most important good news :). We are now working on the last tuning tasks and we promise to release the new edition of GreenPepper as a fork of it very soon and may be with a new name ! Note: if you want to be informed about the Successor of GreenPepper just drop us a message! would love to see your latest release. When will you deliver it? 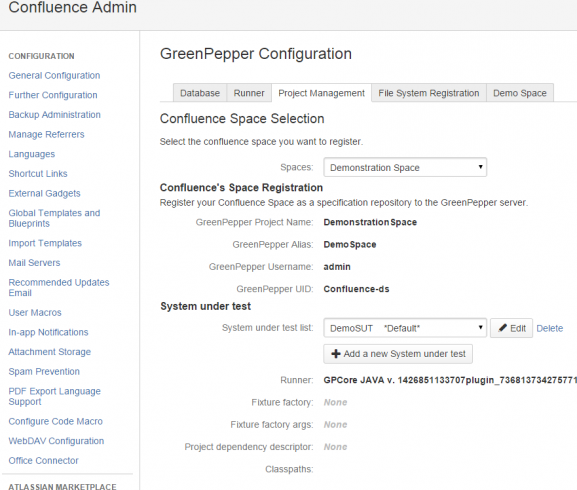 For those of you wanting to upgrade to confluence 5, or to get the binaries for greenpepper, I have forked and worked on the greenpepper source code. I am now happy to announce a BETA 2 that should meet your desires. I have tried to get what I could of the previous documentation ( using Archives.org ) and put it on a website. I made this work before knowing the existing work of Novatec, but I would gladly merge what is possible to merge. This would come in very handy. What’s the current status? Greenpepper was/is awesome! Please notify me when the new release is ready. sorry for the delayed response, we have not noticed your comments because of the holiday period here. Our plan is to release a version in the next two weeks. My team is using confulence to define its specs and I have suggested we attempt using a specification by example/ATDD approach. Greenpepper is the only software which I have been able to fine which might make this happen for us. How are things looking with the development? Is there any progress in this tool? We are excited to wait about it! This really encourages me to believe that the project has found worthwile stewards at last. I will be hoping for a OSS release announcement soon(ish). Thanx for your motivating feedback. we´ll inform you as soon as we are done. Keep tuned ! Because we have done a lot of refactoring which led to a completely new structure of the modules we will need to rename the fork of greenpepper. We are working on a new name and checking license issues and we will put the source open as soon as we are done. Is the new development done in open or is this now closed source project? Same here. Please notify when you release it. Would be really nifty with BDD support for confluence. Is there any solution to get notified about the greenpepper release?